The Maogma team will design your initial pesonalized sample itinerary for free. If you have further questions please do not hesitate to contact us. We wish you a hassle free holiday planning and an unforgetable holiday! Restful and stress-free: Travel according to your needs. 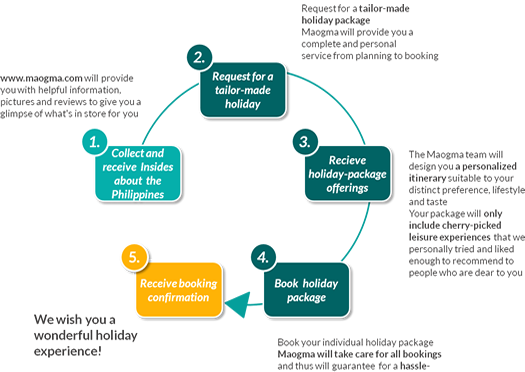 Maogma is your trusted luxury travel agent in the Philippines bringing you tailor-fit travel packages from take-off to landing. We have everything taken care of, so just sit back and savour heaven’s gift to earth – the Islands of the Philippines!